"Fashion fades, only style remains the same" Coco Chanel. 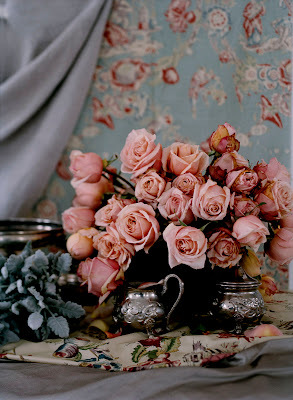 The tea stained look of those roses is so very beautiful. Gorgeous indeed! I love that chanel quote, too :) Have you seen the new Coco Chanel trailers with Audrey Tatou? Very yummy! So romantic and soothing- great pic! Have a wonderful weekend. You enjoy the weekend and thanks for that lovely quote and amazing roses....oh how I love that color!!! One of my favorite quotes and one of my favorite movies! Love the Coco Chanel quote. Have a great weekend, Kellie! The flowers are beautiful..Have a wonderful weekend! These roses make my heart bloom with so much love! SO gorgeous! lovely quote... Have a wonderful weekend. Wisdom for the ages! Happy Friday! That quote is so true (: Love the image! Love that quote and the flowers are so beautiful! Wouldn't mind some of those roses. Those roses are such a beautiful color of BLUSH pink. I think i need them! Lovely picture. The flowers are so pretty.